A desert rose plant (Adenium obesum) displays tubular, single, double or triple blossoms in white and vibrant shades of red, pink and yellow, and the blossoms are in terminal clusters. This slow-growing, perennial succulent that is a shrub or small tree bears glossy, deep-green leaves near its stem tips and forms an irregular swollen trunk, called a caudex, which is mostly underground. The sap of the plant is highly toxic. Desert rose is hardy in U.S. Department of Agriculture plant hardiness zones 10 through 12. In Florida, desert roses can be used as container plants for a patio or rock garden and also can be grown in the ground. 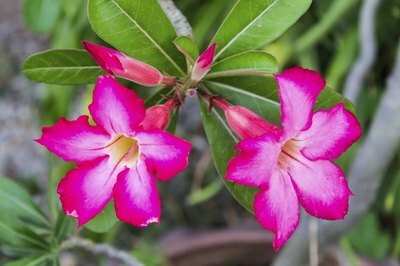 Desert rose plants in Florida require a site exposed to a minimum of six hours of full sun per day. They can be grown as shrubs or small trees and are drought-resistant but do best in moist, well-drained soil. Desert roses cultivated in the ground require consistent free-draining soil and should not be planted near automatic sprinklers to avoid root rot. In areas where the temperature frequently drops below 35 degrees Fahrenheit, desert roses should be grown in containers that can be moved indoors. A period of dormancy occurs in the plants with nighttime temperatures between 39 and 46 F or with daytime temperatures between 60 and 64 F. A change in the weather can lead to partial defoliation of the plants. Typically reaching a height of 4 feet and width of 3 feet, desert roses can grow up to 6 feet tall in southern Florida. Specimens grown in containers should be repotted on a regular basis to achieve their desired size. Desert roses grown either in the ground or in containers require a balanced blend of fertilizer, such as 10-10-10 in granular form. Wash off all foliage that gets fertilizer on it. In-ground plants require a fertilizer application in early spring and before November. During an application, give each outdoor desert rose 1/2 cup of the fertilizer per each 1 foot of the plant's height. Sprinkle the fertilizer evenly on the soil under the plant's branches, and then water the soil well. Fertilize each potted desert rose every six to eight weeks, using 1 tablespoon of the fertilizer per every 6 inches of pot width. Sprinkle the fertilizer onto the soil before watering it, and then water the soil well. Pruning stems above the desert roses' leaves promotes bushier growth in the plants. Such pruning should be done once each year, between February and September. Wear waterproof gloves while pruning and handling the plant and its debris to avoid the toxic sap. Sterilization of pruning tools helps to prevent the spread of diseases from one plant to another. A mixture of either one part household bleach and three parts water, or one part rubbing alcohol and one part water, can be used as a disinfectant. Tools should be soaked for a minimum of five minutes and then rinsed with clean water and air-dried before used for pruning. Root rot is likely to occur in desert roses if their soil is not well-drained. Overpotting may lead to water retention, and so each plant's container should not be much bigger than the size of the plant's root mass. Leaves affected by a fungal disease called anthracnose turn yellow and fall from the plants. The leaves should be raked and disposed of in the trash. Anthracnose is controlled by the change of the season. Mealybugs, aphids and spider mites dislodge from outdoor desert roses treated to a strong spray of water, which can be applied as often as necessary. Mealybugs as well as oleander caterpillars can be hand-picked from the plants, but wear gloves while performing that task. Seeds and cuttings are used to propagate desert roses. Seeds lightly covered with soil germinate within three to seven days. The seed tray should be kept in a cool, dry place and then slowly acclimated to full sunlight once leaves appear on the sprouts. Flowering may begin in as early as 12 months. Cuttings at least 6 inches long should be taken from the tips of a desert rose and dipped in rooting hormone before being planted upright in containers. Keep cuttings in moist, well-drained soil in an indoor area with high humidity for the best results.